Purse Seine nets are used in many different fisheries around the world to target such species as Salmon, Herring, Tuna, and Squid. 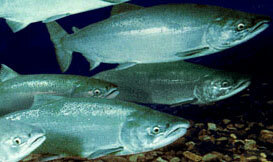 In Southeast Alaska, summer brings the various species of salmon back to spawn. Seiners from up and down the west coast arrive to take part in the harvest. Here is a short video that shows some scale of the salmon nets and how beautiful Alaska is through the inside passage. Alaska Department of Fish and Game is a wealth of information on species, annual harvests, and types of vessels. Check out there site for more info!